← Oruro Governorate: Lake Poopó grew to more than 1,300 kilometers and it’s time to stop mining access! A clear example of how Bolivia “changed” under the government of the coca caudillo! evo planted the seed of resentment, totalitarianism in his relentless search for indefinite power … the concept “red ponchos” only started under this government, a campesino militia that is one of the hard radical aggressive groups that support evo …. based on racist concepts this group is now fighting among each other, as the easy money faded away and there is internal disagreements regarding evo’s egocentrism … there may be some of them who want to replace evo and his acolytes’ leadership … in the meantime, our democracy faces more dangers, intolerance and brutal force replaced the pacific coexistence we had before evo … The above opinion is from Bolivian Thoughts. 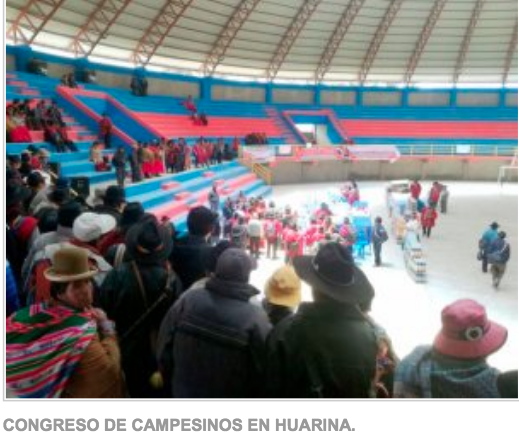 More than 20 people were injured after a confrontation between Ponchos Rojos during a congress that took place in Huarina to appoint the top representatives of the Omasuyos province, an event that also had the presence of Foreign Minister Fernando Huanacuni, the Minister of Productive Development , Eugenio Rojas, and the mayor of Achacachi, Édgar Ramos. According to ANF news agency, firecrackers, stones and blows were used in the fight that staged the Ponchos Rojos from Warisata and Achacachi on Friday afternoon in Huarina to avoid possessing people related to the MAS in the position of Provincial Executive, which is the highest authority of the Omasuyos province. The cantonal executive of Achacachi, Freddy Tallacagua, told that the congress sponsored by Huanacuni and Rojas was carried out illegally with only 10 cantons, pretending to ignore the representatives of 27 cantons. This entry was posted in Bolivia, La Paz, Politics, Social Unrest and tagged bad politics, demagogue, democracy in peril, government failures, violence. Bookmark the permalink.